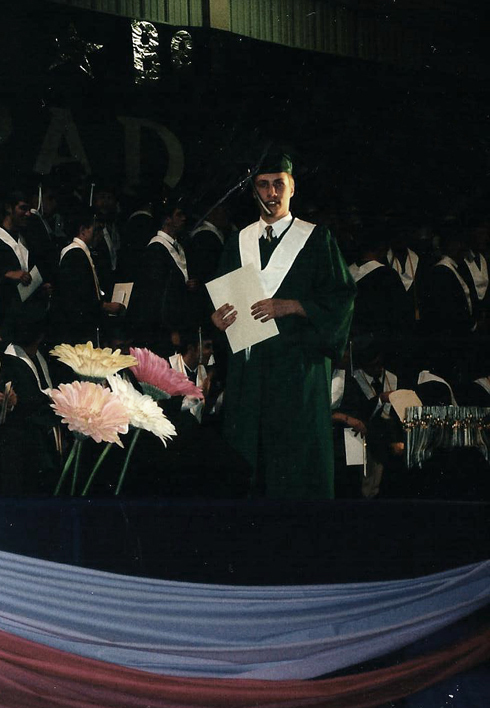 What's kind of amazing to me isn't that ten years have gone by, but that this milestone of being out of high school doesn't feel nearly like the occasion I thought it might have been back in 2002. If I'm entirely honest, Facebook ruined the mystery of the reunion when I signed up back in 2007. My grad class is literally just a click away, and random messages aside, you hardly have to try anymore to be updated on where everyone has ended up. The reunion is officially at the end of July, which is bad timing for me anyway as I'll be away rafting with my family that weekend. I still think I'd go if I had the opportunity, but frankly it kind of seems like the perfect breeding ground for awkward conversations. I had a good high school experience, so I never fantasized about my reunion being the opportunity to show anyone up or confront a bully or hook up with the girl that got away (although if I'm honest a lot of them got away). I went back to my old photo albums to do a bit of reminiscing and it's so disappointing to see how few pictures I took. Especially in comparison to now, it's like I hardly made a record of any of my high school experiences. Even just after posting about Humblfax's Facts a few days ago, it seems crazy to me now that we didn't bother shooting more pictures doing stuff like that. I did find a handful of pictures that I remember shooting on disposable cameras at Safe Grad though. 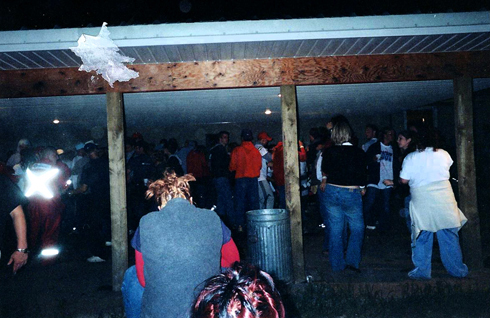 Safe Grad was the official party after graduation where alcohol was allowed and buses chaffeured students between the farm where the party was and the city. I remember that I was already drunk by dinner, and by the time I was changing out of my tux in the parking lot I was well sauced. If there was anything I was dying to say to anyone, that was probably the night it happened. My friend Taron and I hung out a lot that evening, and as a lot of the pictures seem to suggest she was probably the main reason I was still standing as the night went on. 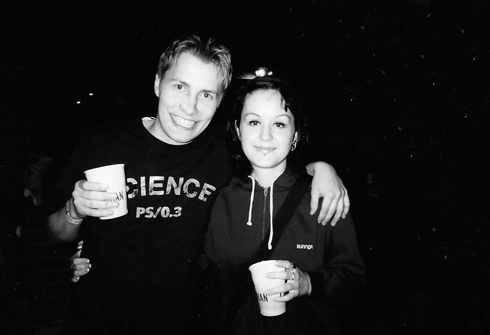 I remember having her check my drinks towards the end of the party because I was paranoid that the bartenders (who were a few of the parents) had cut me off and were just giving me Coke - they were, and it was probably for the best. It was an awesome time and I had a lot of fun celebrating and saying my goodbyes. 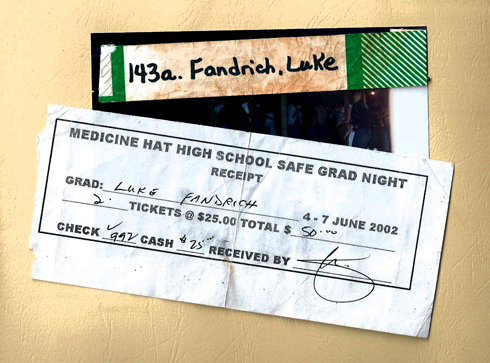 Tucked behind one of the pictures I even found my wristband from Safe Grad and the receipt for the tickets. It would seem I was making up for lost time with all the snapshots I took in those last few weeks of high school. I think the most meaningful thing I've realized after a decade is that you really do just hold on to the good stuff. 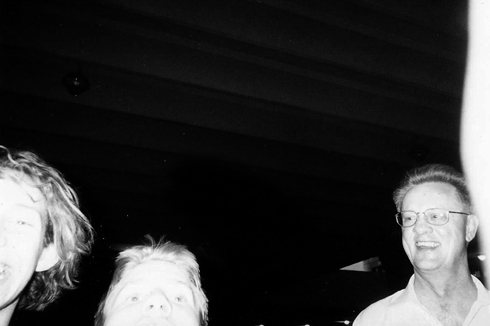 The last picture I shot that night of my Dad picking us up at the bus depot. It seems to sum up the night quite well.